What do you do when you’re inside a toilet? You might think about your things to do, just use your iPhone, or read a magazine. But, it’s different when it comes to a professinol performer. 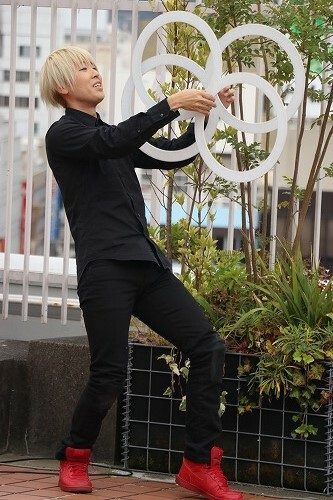 He thinks about juggling even in a toilet. 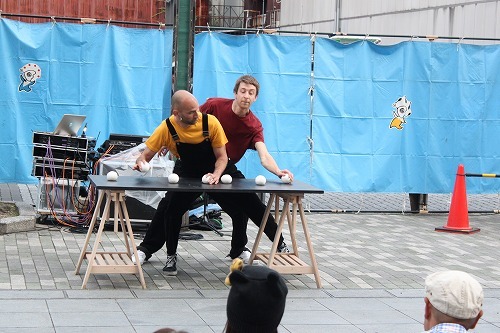 Then, he comes up with an idea that juggling with rubber cups! Juggling with daily stuffs might be fun! This is what Gili, a member of Duo Comic Casa, think. Duo Comic Casa is a duo of married couple. The husband's professionality is juggling with rubber cups. You may have seen darts with knives. However, have you ever seen darts with rubber cups?? This is what Duo Comic Casa do. 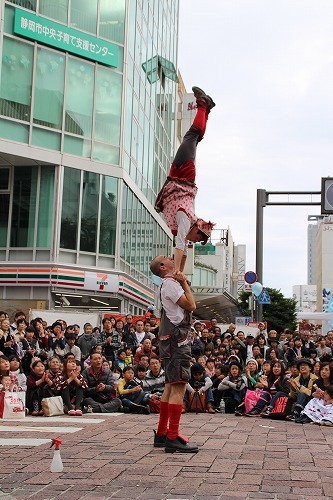 On the other hand, his wife Karin, who trained acrobat with trash can at a circus. They love cleaning up, because they are professional. Real professionals turn daily products into juggling tools. They show us new color of the world. They blow you away and clean your prejudice away! 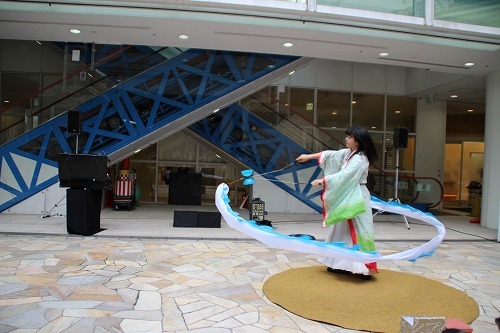 You must come to the Daidogei World Cup in Shizuoka to see their performance. Also in this kind of festival, love is all around. You might find your love in the festival. Just like Duo Comic Casa found their better halves in festival at Macedonia 10 years ago. 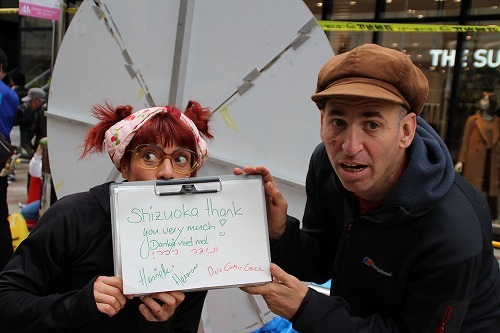 Shizuoka got a message from Duo Comic Casa. "It's been a long time long time ago since I see your smile. " When was your last time since you laugh from the bottom of your stomach? 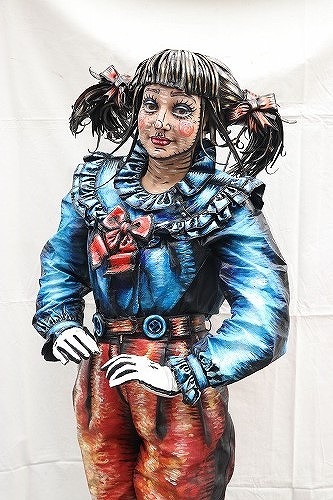 Barada Streert is comedy performer, singer, crown and acrobatic performer. Some audience said that the best fusion of music, crown and acrobat. They can play ukulele in such a strange form. It will amaze you. Especially, their theme song "Nantes" matches with their performance. There is no word to explain how great it is and I even asked them how they decided to play the song. Then, they said "That is because it was the only song that both of us knew! It is a kind of coincident". But, the song matches their performance perfectly and sounded like band Beirute composed it just for them. It is literally a perfect match with their show. At the end of their show Barada Street and all audience sang together "Barada da Barada da...."
Let's sing "Barada da Barada da" with Barada Street in Shizuoka. I can guarantee you, you will love it! Shizuoka is a place, where an angel is coming down from the moon. In Japan, we believe that angels are dancing on the moon. 15 of them are wearing white dress and the other 15 are wearing black. On the first day, All 15 angels with white dress are dancing on the moon. It was the full moon. Day by day, one black angel is out from the stage and a black angel is replacing. So, on 15 days all black angels are dancing. The moon gradually changes its shape every 30 days. This is a Japanese version of explaining how the moon change its shape. 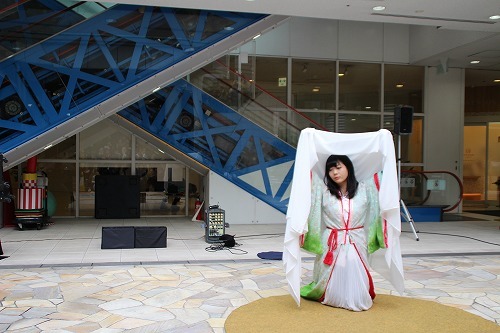 This story is also explained in Japanese traditional opera, which is called "Noh opera Hagoromo(It means a dress of the angel)". 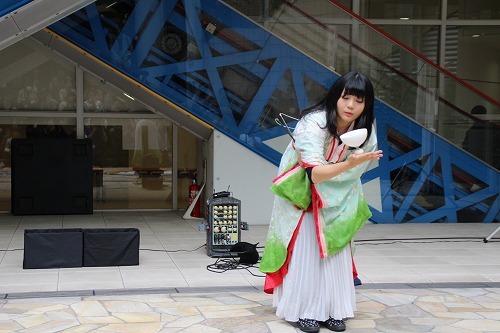 Hereby, an angel is falling down from the moon to Shizuoka once again. Her name is "Kaguya" , who is the most famous Lunarian and a princess, or I should call her withname on the earth, "Rika Megumi". As following the legend, at first she wearing the white costume and she changes to the black dress. 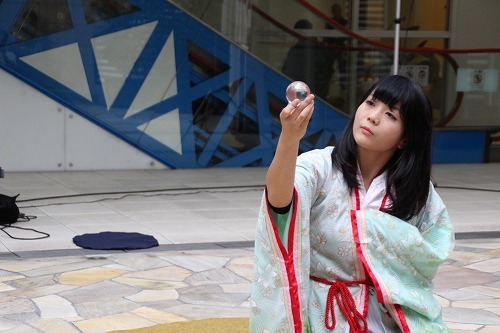 This time she dances with a diabolo. How beautiful her dance is! Maybe her dance is not from the earth, It may be from the moon. Her dance Bewithced us, Bother us and Bewilderd us. You don't need to go to the moon to see her dance. Just come to Shizuoka. 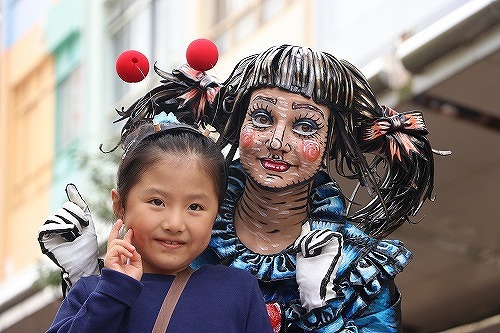 Tomorrow is the last chance to see her dance this year. Her venue is just beside a department store called Isetan on Nov. 4th. I guarantee you that she magic you and you will fall in love with her. Fly me to the moon!! 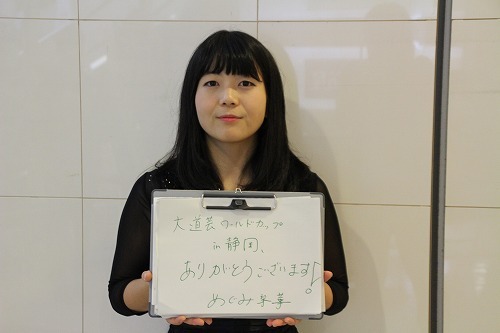 The angel also give us a message." Thank you Daidogei World Cup in Shizuoka! (Rika Megumi)". Kerol, a 37 years old Spanish male performer. One of the best in the world. 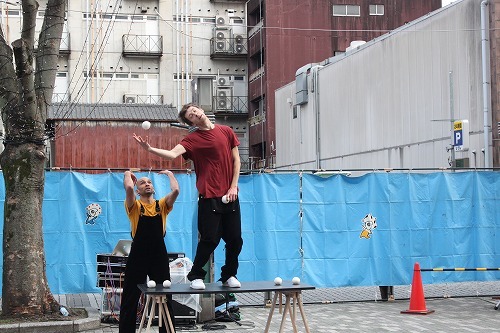 He mostly perform juggling and beatboxing, but it does not end there. He even puts humor in it too. 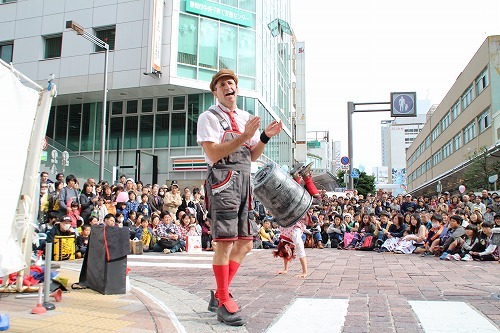 He entertains people by converting humor with both beatboxing and juggling and also making the audience a part of his show. In his beatboxing, Kerol first shows his own spectacular skills and then starts to make all of the audiences get involved to that show. While doing that he even makes jokes to entertain them of cource, but also to soften the atmosphere to let the people participating, feel easy to perform with Kerol. 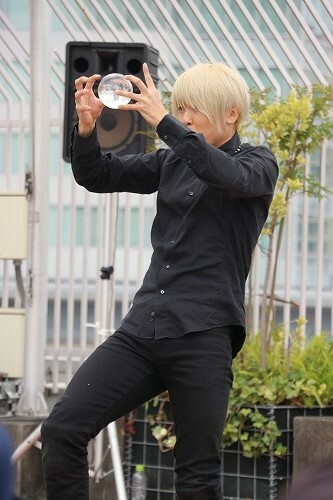 Later on, he juggles, where he shows off his great techniques; slowmotion juggling, reverse juggling and other amzaing tricks. His jokes are really good and unique, he even makes people from other countries laugh. Kerol starts perofming becasue it was fun and he learned all of the tricks by himself on the streets. After few years, he joined a circus in France that teached him how to act and how to make a show. He is so active and a very truthful man. People can know it just by looking at his performance. This proves how amazing his performance is. Kerol said "Pleasure and Fun is the most important thing for my performance". He said those two are the reason why he has performed for over 10 years, the reson why he can make people laugh and himelf too at the same time, and lastly, the reason why he can have fun with also giving fun to people. A great quote made by one of the greatest performer in the world. 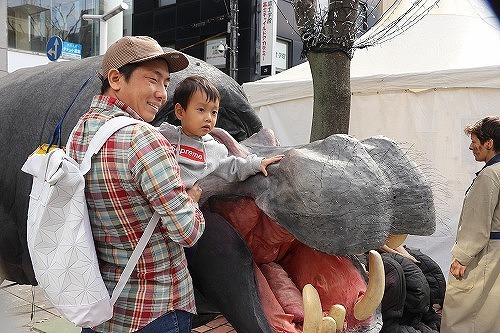 Do you remember a giraffe suddenly appeared on the street of Shizuoka during Daidogei World Cup a few years ago? 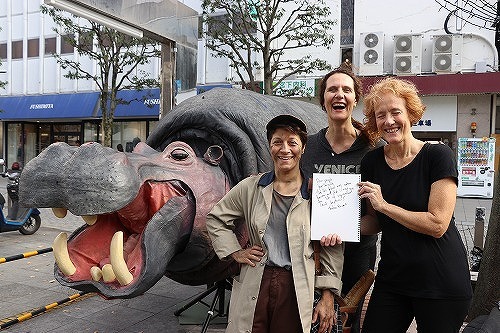 Twice with the giraffe, once with the ostrich, and this fourth time, Teatro Pavana is back to Shizuoka with a lovely hippo, Nellie! 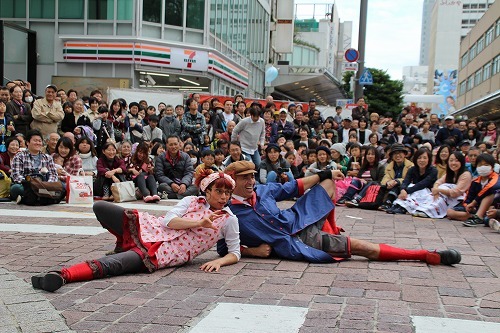 Teatro Pavana is a street theater company which was founded in 1993. Judith, Giulia, and Alkisti are participating in Daidogei World Cup this year. Nellie the Hippo catches people's eyes just by walking on the street with the zoo keeper Alkisti, and there were always crowds of people around Nellie. Why they chose a hippo? 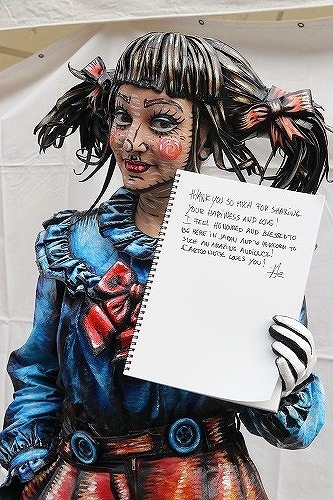 They answered, "through performing various acts, we really enjoyed making animal masks and costumes." "Also", they added, "we make other animals such as a giraffe and an ostrich, but hippo is a very theatrical animal with a big mouth." Adding to the physical appearance, Nellie has lovely, silly, and sometimes a bit naughty character that everyone loves. 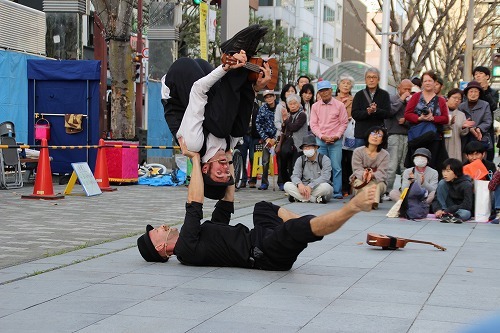 Both today, November 3rd, and tomorrow, November 4th, Teatro Pavana will be performing on Walking Street 2 in Down Town Area. Please look forward to the random encounter with Nellie the Hippo! Adam & Benjamin, the duo from Hungary, uses Chinese pole and performs very thrilling acts. 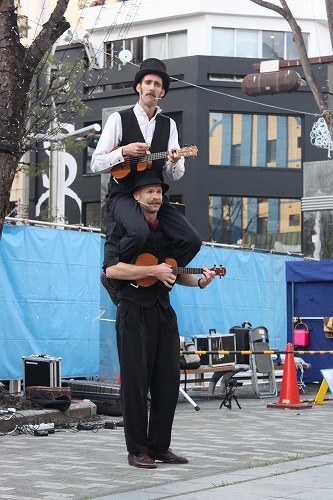 The duo met in circus school and became good friends. Adam was searching for new apparatus when the teacher introduced him to Chinese pole, and he was captivated by it very quickly. Adam's good friend, Benjamin started Chinese pole act 1 month later. 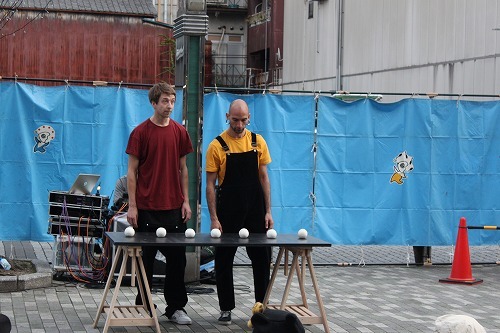 The duo has also performed with trampoline, but they decided to stick with Chinese pole and have been performing 6 years. The trust is very essential in such thrilling Chinese pole act. Since they are good friends and have been performing for years, their trust for each other is very strong. They say the trust comes with the time by practicing everyday and spending time together. Now they know what each other is doing and how the other is going to react next during the practice and performances. The duo wears black and white costume, but in completely opposite pattern. Even though the duo wants the audience to think what that means, their story is based on friendship. In the beggining, they are friends and messing around each other, but at the end, they stop messing around and start to work together. 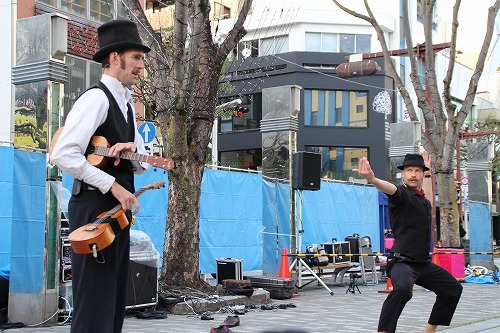 Many other Daidogei performers have their own story in their act even though they often don't tell verbally and let the audience interpret by themselves. 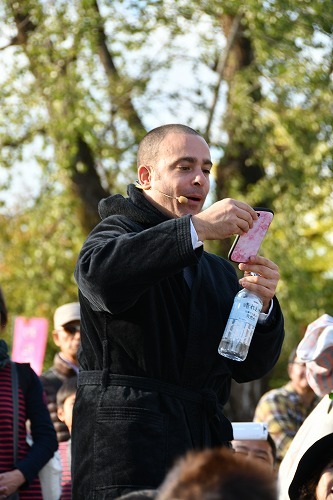 This is one of the unique and fun part of Daidogei. 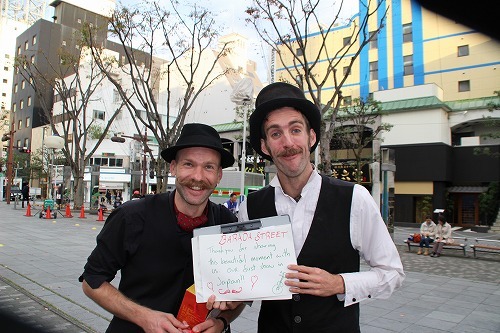 This is the duo's first visit in Asia, and they said it is the biggest accomplishment. 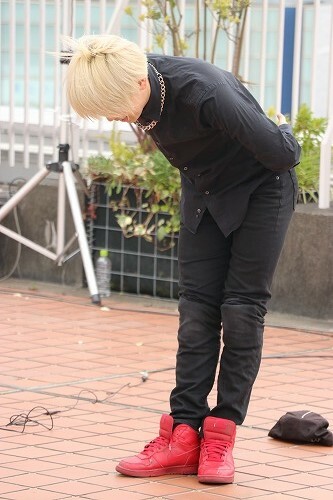 They think Shizuoka audience are lovely, very kind and warm. They will be performing in World Cup and Premium Night Show on Saturday, November 3rd, as well as multiple street performances throughout the weekend. Let's make their first visit in Asia filled with warm welcome and love! Alex is from Ireland. He was borne in a rural area, which is full of nature, full of living things. In other world, he was borne in a beauty of chaos. That's why he has a playful personality. Davi is from Brazil. He was borne in an urban area, which is full of artificial structure, full of people. In other word, he was borne in a beauty of order. That's why he has a strict personality. There show is the battle of two different personality, the battle between chaos and order, playful and strict, Apollo and Dionysus. Using balls, they express the battle of two opposite personality. On the table, 7 balls are on it. Once Alex throw up a ball, immediately Davi fix it to make an order. Their battle getting harder and harder, but in one point, you will notice that it's make an harmony. Both of them compliment each other. They believe that even though personalities are opposite, it doesn't mean that they are fight each other, but it could be co-exits to compliment each other. They might look different but, in humanity they are heading the same direction. 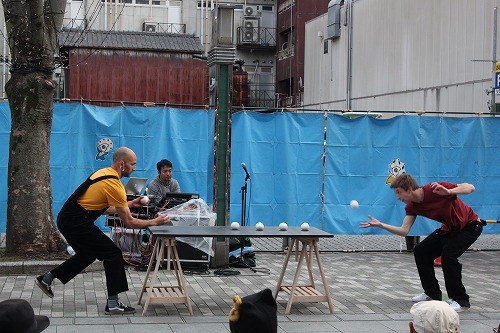 Their performance is not just only a technique to fun, but it has a story to rethink about our life. How we can live with respecting the others? How we can live in the world, which is full of strangers? How we can co-exist? 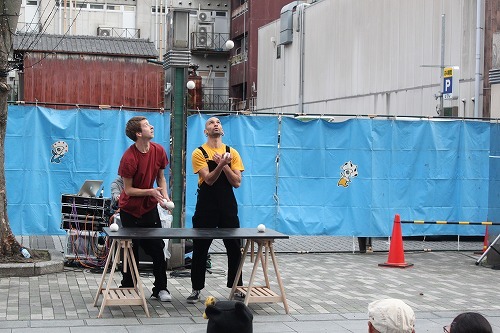 Two jugglers, or I could say philosophers are asking you a question.